Ringo gave his hole to the Albert Hall. Some of John's lyrics in A Day In The Life were ripped from the headlines. John wrote another song like that but never recorded it. What news article inspired this other song? 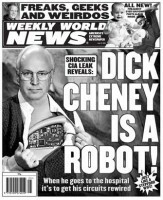 : "Cheney is a robot, and I ain't too surprised ..."
There was also a hidden message to Ronnie Spector in the song's lyrics. What was the message, and how did Ronnie respond? The message: "Ronnie had her Phil"
What game, enjoyed immensely by the locals, did John get very good at and learn to love while in Hamburg? The "Eat as much hamburgers as you can in One minute" game. What was his record in this game and what song inspired him? In his 1984 interview with Rolling Stone's Jann Wenner, John Lennon recalled the recording of his post-Beatles solo cover version of the Hall & Oates hit, saying, "'Did It In A Minute' -- that's all Paul; couldn't you guess? Would I bother recording a song like that?" What famous bet did Brian Epstein lose to George Martin in 1965, and what was the wager? Brian said that if the fab four's next single only got to no. 2 or below, GM owed him a bottle of claret. But the next single was We Can Work It Out /Day Tripper , so BE owed GM a bottle instead. How should it be? many insted of much? As many as holes he needed to fill the Albert Hall. Why did he need to fill it? "Much" fits the vibe of the Q&A going from German to English and then being said by John Lennon . Why did he need to fill it? Because he is the one who emptied it. Before the final color of the submarine was chosen, which color was the runner-up and why was it passed over in favor of yellow? Yes. Am I correct in supposing English is not your first language? but it was rejected because sub-marine, everything was green and submarine, and they wanted their sub to stand out. Also, yellow looked more like a submarine sandwich. 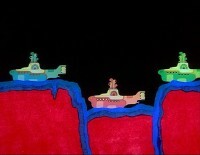 Who lived in the Yellow Submarine ? Who wrote the aaahhs in ADITL? What was the inspiration? the inspiration for the Aahs came from a little unknown detail. When Paul made the bus on seconds flat and had a smoke and right after somebody spoke he went into a dream. Then the cigarette dropped from his lips setting the bus on fire. Paul woke up to the sound of the other passengers screams and decided to use that as inspiration for his next song. Each and every passenger wrote an Aaahh in the original lyrics sheet. Where was Paul going when he took that bus? on a Magical Mystery Tour , of course. So no one could say where exactly. Riding nowhere, probably; riding so high, definitely. Who lived in the Yellow Submarine Sandwich? The everyone, as the Yellow Submarine Sandwich was the universe. What happened to the Yellow Sub Sandwich Universe? @Shamrock Womlbs, one uses 'many' for countable nouns, (eg. Hamburgers, cats, spoons), and 'much for non-countable nouns (eg. Luck, sport). Crystal clear now, thank you very many much! It imploded when mr. Mustard left. A sandwich without mustard in it is not a sandwich. Who was suposed to be Ringo's replacement when he left the band? They asked this guy named John Henry Bonham, but he said his friend Bob had just hooked up with this session guitarist who wanted to start a band and they wouldn't leave his favourite pub alone until he accepted... so the Beatles broke up instead. Ten years gone, when the Bonham guy also left the universe, that band he was in broke up too. What did George name his psychedelically-painted Fender Stratocaster? What piece of furniture did John have delivered to Studio 2 for Yoko's use? How did she use it? Extra amps for her to sit on. What item to food did Yoko steal from George and what was his reaction? Yoko stole George's rock candy-coated stratocaster "Rocky" not to eat, but to play, as she was auditioning to join the Beatles that day. George impulsively decided to not fight the tension any longer and rushed up to Yoko, pulled her close, and kissed her passionately, to the bemusement of the other Beatles and George Martin. Young George then promptly left the studio. The next day at rehearsal no one spoke of the incident except Harrison, who stated matter-of-factly, "She's not joining the band." Whom else did Beatle George impulsively kiss, and what was the band's reaction?